Embarking on raw feeding is a big step for most dog owners. Most of us spend a lot of time looking at the pros and cons of raw feeding, asking should we or shouldn’t we. And balancing up the risks and benefits before switching to raw dog food. But of course there is more to it than that. If we are going to feed raw and keep our dogs healthy, we need to be able to obtain a range of good quality natural raw foods. And we need to be able to get those foods without embarking on a military expedition. Otherwise the whole raw feeding project becomes untenable. In this article we’re going to look at 9 great raw dog foods that are easily available to all pet owners, and that will provide your dog with a good range of nutrients. Many of these items can be purchased from your local supermarket. 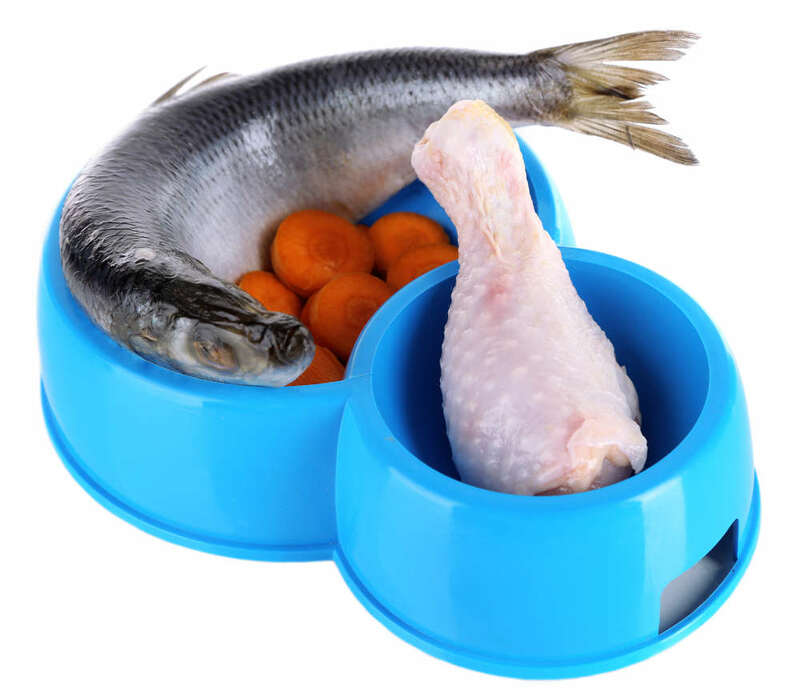 Others are available from raw pet food suppliers who tend to deliver to most areas on a monthly basis. Most of us have a box of eggs in the larder or fridge. To begin with, some dogs need you to break the egg open for them, and even mix it up a little with a fork. 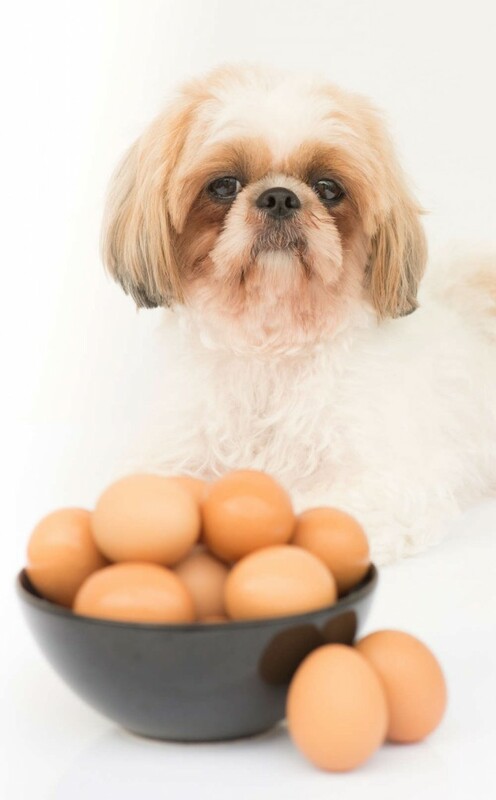 Once he gets used to eggs, your dog will be able to manage them by himself. Some dogs eat the shell too, others will leave that for you to clear up! Most supermarkets do ‘value packs’ of chicken wings. These are great food for puppies, and small dogs. They have quite a lot of fat and skin on them as well as the bone your dog needs to keep his teeth clean and his gut healthy. Fish are a wonderful source of nutrients. Especially if you feed whole so that the dog gets the eyes, gills, brain etc. Suitable fish to feed whole and fresh are mackerel, sardines, spratts and other small fish. You can snip off fins if you want to, but most dogs seem to naturally know how to eat a fish head first so that everything slides down nicely. You can also feed large fish like cod, but be aware that the bones in the head of bigger fish can induce vomiting in some dogs. Some butchers do still sell pigs trotters though you may need to order them in advance. Otherwise, you can purchase them from suppliers of raw meat for dogs. Dogs really enjoy gnawing on a trotter and there is a good range of nutrients in each one. Your dog will eat everything including the hoof, bone, skin, and all the meaty goodness attached to it. A rib cage is a great source of pleasure for any dog. Ribs are one of the few bones you can feed from really big herbivores such as cattle. Bigger, weight bearing bones, are a bit tough on dogs’ teeth and best avoided. But rib bones are more pliable and can be consumed quite easily by most dogs. Tripe is the stomach of herbivorous animals such as cows or sheep. Tripe was a popular source of food for people seventy or eighty years ago but has fallen out of fashion. The sort of tripe our great-grandparents ate was white or ‘washed’ tripe with all the stomach contents completely removed. Green tripe is unwashed and is a grey green colour due to the remnants of the animal’s stomach contents which still cling to its surface. This makes green tripe both smelly and incredibly nutrient rich. If you are feeding ‘whole prey model’ raw, it is important to feed green tripe a couple of times a week so that your dog has access to these nutrients. A whole rabbit carcass is an ideal source of meat and bone for a raw fed dogs. The bones are small enough for the entire carcass to be edible. Some butchers still sell rabbit, though it tends to be the domestic hutch bred variety. If you live in the countryside you may have access to wild rabbit, which is an almost perfect food source for a dog. Apart from the gut (which may contain tapeworms) every part of this compact animal can be consumed. From head to tail and including the paws. You can feed rabbit skinned, or in its ‘jacket’. Similar to rabbit in proportions, is the chicken back and neck that butchers throw away after removing the breasts and legs for human consumption. These are very cheap and popular with raw feeders and can be readily obtained from raw food suppliers in bulk. It is important if you feed chicken backs regularly, to add some ‘flesh’ meat to your dog’s diet as they are quite boney. Another part of the animal no longer highly favoured by people, heart and lungs make great dinners for dogs. There’s no bone in them and a proportion of your dog’s diet should be bone, so remember to feed with something more boney, or to alternate with bonier meals during the course of the week. This is not a feeding guide, we’ll be bringing you one of those later. These nine foods are not the only thing you can or should feed your dog. There are many foods out there that are suitable for raw fed dogs. This is just to give you a ‘flavour’ of the kinds of food and the range of food that you can expect to feed a dog on a natural raw diet. Many people, when first feeding raw, over-feed boneless meat such as mince or cheap cuts of steak, and underfeed bone. One way to help you get your head around the quantities of bone a dog needs is to think about the proportions of an entire small animal. Something the size of a rabbit or chicken. Ask yourself if your dog’s dinner has flesh and bone in those sort of proportions. Think of meals as being meaty bones, rather than ‘meat AND bones’ and you won’t go far wrong. There is a great deal more to talk about when it comes to raw dog food and we’ll be looking at various other aspects of raw feeding in the weeks to come. We’ll be tackling the different approaches to raw feeding, getting supplies, the tricky ’switchover’ period, quantities, proportions, balancing the diet, feeding schedules, and much more. Here is our guide to the getting started with the basics of How to Feed your Puppy on Raw food. If you are not sure whether or not raw feeding is for you, do check out our Pros and Cons of Raw Feeding article. And drop back soon for more puppy care and feeding information and advice. If you are already raw feeding, share your dog’s favourite food into the comments box below! Hello. We just got a new pup. She is a German Shepherd and is now 8 wks old. When we came home the breeder told us to feed her 4 chicken necks a day 2 x per day now she is up to 6 and seems as though she wants more in the middle of her 2 feedings. I also would like to know what else she should daily? Do you have any advice for what a daily menu should be. I feel lost and want to be sure she is fed well and gets all the nutrients she needs. Please help me because I see so many great articles but none that actually give an idea of an actual daily menu/weekly menu. Thank you. This article gave you all the information you’re asking about. My Shih Poo will be ready to come home in 2 weeks. At that time she will be 8 weeks old. I plan to start her on a raw diet on day 1. I’ve read every article on this site plus like 30 more and the opinion seems to be split when it comes to whether i need to fast her for a day or if i can just jump right in to raw or if i need to mix raw and kibble ( which i am least excited about). I’d like to stop kibble asap! Also, should i start her on chicken wing tips or thighs (both with bones) right off the bat? or should i maybe start her with ground or minced with bone in it for a week? I’m also an avid juicer so i plan to add certain pulp to her meals daily but how much would be appropriate? Maybe 1/4 cup daily? And if i give her a rib bone, should i expect her to eat the entire bone or should i toss it out once she’s eaten the meat off and left it alone? Sorry to have so many questions but i just want to do right by our precious little bundle of fluff. I like the idea of feeding a.raw diet, but am overwhelmed by it all. I opted for feeding a frozen raw diet and rotate through all the different meats offered and on ocassion different brands because I’m concerned that.he may be missing something. How do I know if he is getting everything he needs to be strong and healthy? I’m just worried that his meals.may be missing something. My edits to above question. Puppy is 9 weeks not months. Also I supplement my current raw feeding with spirugreen, ground pumpkin seed, turmeric, Mercola pro biotics and digestive enzymes, ground flaxseed, eggs, liver, salmon. In smaller quantities should I include these into the puppies feeding program? I don’t feed my dogs any supplements at all so I wouldn’t like to comment on those. I doubt a healthy dog fed sufficiet variety, would need digestive enzymes, or ground seeds, unless your vet feels his diet is lacking in some way. If you provide a wide variety of meat and bone, including muscle meat, organ meat, eggs, fish, a little offal, and green tripe, your dog should be getting plenty of nutrients. Yes, a nine month old puppy can usually eat whatever an adult dog would eat. Provided raw food is introduced gradually. Old JRT puppy to raw.. and he loves it, I have looked at natural instinct site and will definitely use for the not so easily to get hold of but lambs heart, liver and kidney and sprats were very cheap in the supermarket..
We went ‘cold turkey’ and fortunately he has been fine. Thanks pippa I have found your book invaluable as a 1st time puppy parent..
A good starting point is quality frozen raw such as Natural instinct which you can buy from their web site or widely available in most areas. ( NI have a full list of stockists) usually in dog training establishment, animal farm feed stores, some vets. Natural Instinct also offer guidelines on quantities plus they sell supplements. Natural Instinct products are all human grade & produced in hygienic conditions. Some butchers also will sell meats for dogs. Cannot recommend raw feeding enough..it’s brilliant & the dogs love it & thrive on it. My golden retriever puppy is now 4 months old. We got him at 8 weeks & have had him on raw food from the start. He loves chicken wings, chicken, turkey, eggs, & sardines. We just introduced him to green tripe which he loved. The 2nd time I gave it, however, he threw it up. It seems he gulped it down. Any suggestions to help him? I ordered it in 1# ground rolls so it’s ground to a point. I got the kind ground with some bone, tongue, heart, etc. Certain varieties of Natural Instinct has this effect on our beagle x ( although left she will just re eat it) we smear the meat around her bowl so she cannot gulp it down & we ask her to sit every couple of mouthfuls ( she sits in front of her bowl until we say ok anyway). You can teach this with treats first by putting down a circle of treats whilst dog is sitting & telling them to leave but at the same time giving them treats from your hand saying OK. Then you pick up the left treats one by one still feeding treats from your hand. Never let them eat the treats you have put down. Eventually you feed less & less treats whilst they are doing a ‘leave’ but always a treat as reward at the end..apologies if you know this already.? I do use fish oil for my dog. he has arthritis and itchy skin. It was recommended by my vet. I have heard and read only good things about it so fingers crossed it will help him.